VISITATIONS. . . 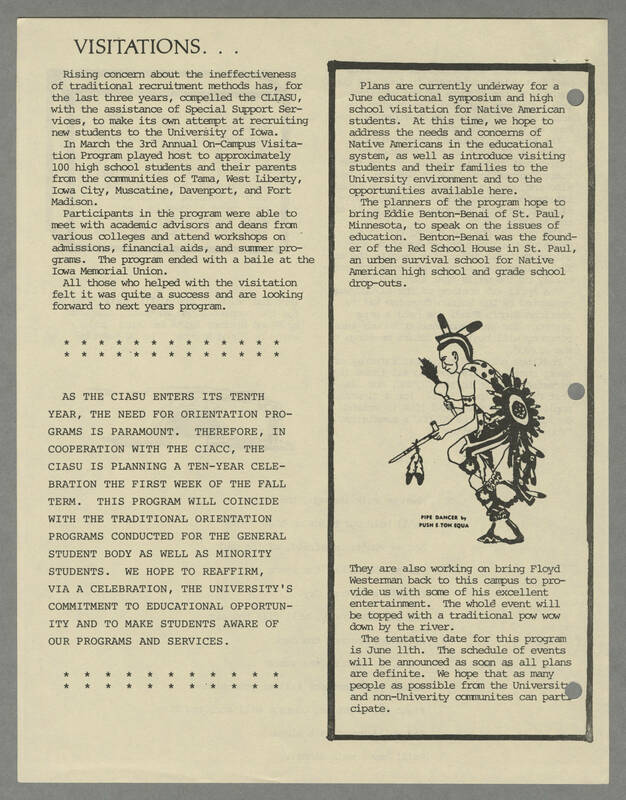 Rising concern about the ineffectiveness of traditional recruitment methods has, for the last three years, compelled the CLIASU, with the assistance of Special Support Services, to make its own attempt at recruiting new students to the University of Iowa. In March the 3rd Annual On-Campus Visitation Program played host to approximately 100 high school students and their parents from the communities of Tama, West Liberty, Iowa City, Muscatine, Davenport, and Fort Madison. Participants in the program were able to meet with academic advisors and deans from various colleges and attend workshops on admissions, financial aids, and summer programs. The program ended with a baile at the Iowa Memorial Union. * * * * * * * * * * * * * * * * * * * * * * * * * * AS THE CIASU ENTERS ITS TENTH YEAR, THE NEED FOR ORIENTATION PROGRAMS IS PARAMOUNT. THEREFORE, IN COOPERATION WITH THE CIACC, THE CIASU IS PLANNING A TEN-YEAR CELEBRATION THE FIRST WEEK OF THE FALL TERM. THIS PROGRAM WILL COINCIDE WITH THE TRADITIONAL ORIENTATION PROGRAMS CONDUCTED FOR THE GENERAL STUDENT BODY AS WELL AS MINORITY STUDENTS. WE HOPE TO REAFFIRM, VIA A CELEBRATION, THE UNIVERSITY'S COMMITMENT TO EDUCATIONAL OPPORTUNITY AND TO MAKE STUDENTS AWARE OF OUR PROGRAMS AND SERVICES. * * * * * * * * * * * * * * * * * * * * * * * * * * Plans are currently underway for a June educational symposium and high school visitation for Native American students. At this time, we hope to address the needs and concerns of Native Americans in the educational system, as well as introduce visiting students and their families to the University environment and to the opportunities available here. The planners of the program hope to bring Eddie Benton-Benai of St. Paul, Minnesota, to speak on the issues of education. Benton-Benai was the founder of the Red School House in the St. Paul, an urben survival school for Native American high school and grade school drop-outs. [[illustration text]] PIPE DANCER by PUSH E-TON EQUA [[end illustration text]] They are also working on bring Floyd Westerman back to this campus to provide us with some of his excellent entertainment. The whole event will be topped with a traditional pow wow down by the river. The Tentative date for this program is June 11th. The schedule of events will be announced as soon as all plans are definite. We hope that as many people as possible from the University and non-University communities can participate.